Most translated non-religious book in the world is celebrating its 75th anniversary. US-based agency Licensing Works has unveiled a raft of activity celebrating the 75th anniversary of The Little Prince. The most translated non-religious book in the world has welcomed new licensed products in support of a charitable campaign across North America, as well as special events and PR activity. The Little Prince has over 150 licensees worldwide offering more than 10,000 products. Efforts are anchored in the US by long-time master publishing partner Houghton Mifflin Harcourt, offering a new 75th Anniversary Edition of the classic novel expanded to include collector’s cover and history of the story. LeSportsac has created a spring 2018 collection of backpacks, baby, cosmetic and crossbody bags themed to the 75th anniversary, which will be available worldwide. The line is available in three new patterns: Travel Guide, Extraordinary Planet and Eternal Things, along with several signature graphic designs. The programme is supported with window merchandising, influencer seeding and digital efforts. Meanwhile, for the first time, The Little Prince will be featured on a full range of infant and toddler products. These will include a line of swaddles and quilts, a soft-book and fabric line, apparel, sleepwear and gifts. A collection of gift and novelty items will also launch, as well as men’s and women’s socks, mugs, bookmarks, prints, music boxes and a number of products specifically ‘Made in the USA’ – a nod to the fact that the book was written in New York City by Antoine de Saint-Exupéry. 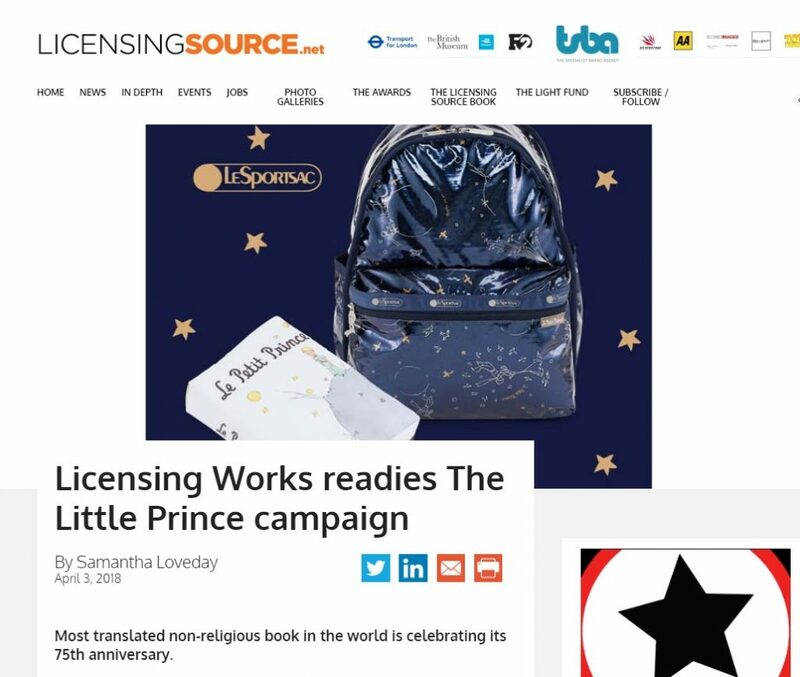 “It’s incredible to see how many people adore The Little Prince and we are thrilled to be working with Licensing Works to give fans opportunities to celebrate and participate in the anniversary,” said Thomas Riviere, general manager, SOGEX, an arm of the estate of Antoine de Saint-Exupéry. As part of the diamond jubilee, people can participate in the anniversary celebration and send a ‘Happy Anniversary’ message by posting their favorite quote from the book or a photo inspired by The Little Prince to social media platforms from April 2 to April 15 with #TheLittlePrince75. For each post, the Antoine de Saint-Exupéry Youth Foundation will make a donation to a new scholarship in the name of The Little Prince to help blind American students pursue their academic goals and achieve their dreams.